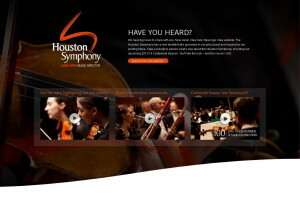 Issue: With the Houston Symphony’s 100th anniversary approaching, and with it a new logo and vivid color palette, came a web site overhaul in consultancy with the Pittsburgh creative and digital agency Chemistry. The popular app has a palm-size events calendar and feeds from the orchestra’s social networks such as Facebook and YouTube. IPhone and Android users have their own dedicated apps. “And we have a mobile web site version of the app that looks just like it for other mobile devices,” Taylor said. Solution: The orchestra upgraded the mobile app to sell tickets in real time and to gain coordination with Tessitura. “Prior to that, the mobile app was just a gateway, a phone number,” Taylor said. The team also made the web site home page responsive—the design sleek, the structure simple and the content central. Cost: The InstantEncore package is a lease depending on an organization’s budget, from $2,500 to $10,000 annually.